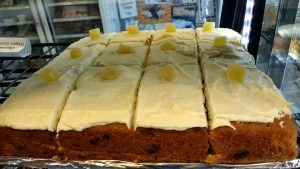 Our cake-making service offers a range of cakes to take away, including many gluten free choices. 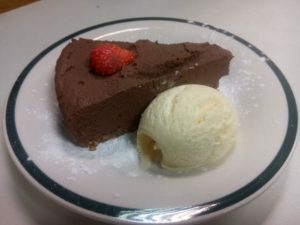 All our cakes are egg-free, dairy-free and suitable for vegans. 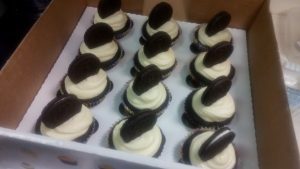 We can make layer cakes, cupcakes, celebration cakes and cheesecakes to order. 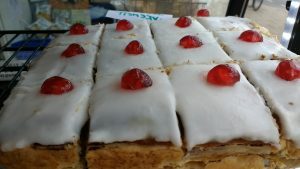 Cakes can be ordered and collected from the shop at your convenience or we can arrange delivery at a time to suit you (delivery prices from £6). 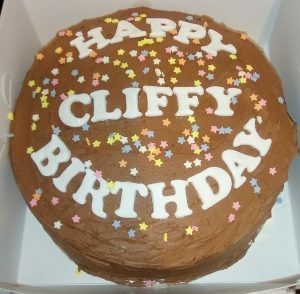 Please note that we require at least a couple of days’ notice for cake orders. Please see the range below and pop into the shop or contact us to place your order. Cakes must be paid for in advance so please have your card details to hand. If you don’t see the cake you want, then please ask us and we will make a cake to your specification. When ordering, please be very specific about any dietary requirements – such as gluten free – that you require as to observe. Spend more than £100 in a single order and we will give you a 10% discount. 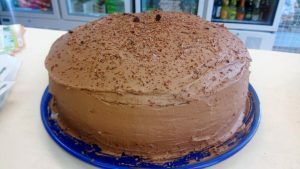 A layer cake with chocolate sponge and chocolate buttercream filling and topping. We can write a short message in icing on top for a small extra cost. Vegan, Gluten Free option, Soya Free option, Nut Free option. A layer cake with soft lemon sponge, buttercream filling and vegan cream cheese lemon frosting. We can write a short message in icing on top for a small extra cost. 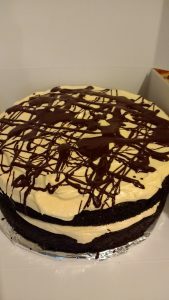 Orange-flavoured chocolate sponge with orange buttercream in middle and top, drizzled with molten chocolate. 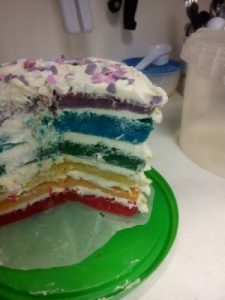 Six layers of rainbow-coloured sponge with buttercream icing between each one. 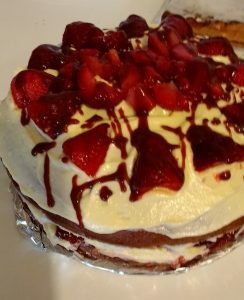 A vanilla layer cake with buttercream and jam filling, topped with strawberries and more buttercream. 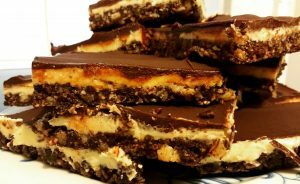 A vegan version of the Canadian Nanaimo bar: biscuit base, custard filling and chocolate topping. A traybake with a pastry base and almond sponge topped with icing and glacé cherries. 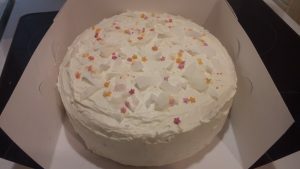 Carrot cake traybake with buttercream icing. 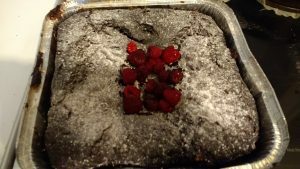 A sticky, gooey chocolate sponge with ground hazelnuts and whole raspberries. Delicious when served warm with a little cream. Vegan, Gluten Free option, Soya Free option. 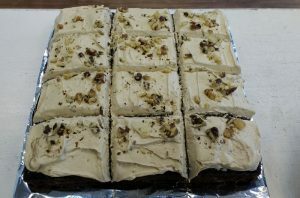 A coffee flavoured sponge with ground walnuts topped with coffee buttercream icing and decorated with walnut pieces. Size: 10 inch (25cm) square approx. Mango purée and vegan cream cheese filling on a crumbly oat base, topped with maple syrup-coated pecans. A very popular choice. 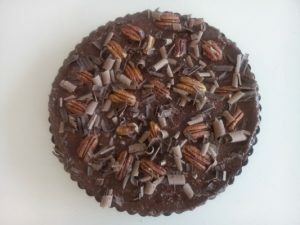 A soft, rich, topping made from melted chocolate and chestnut purée on a delicious base made from hazelnuts and pecans. A pecan nut, oat and date base covered with a rich avocado & chocolate filling, topped with whole roasted pecans and chocolate swirls. 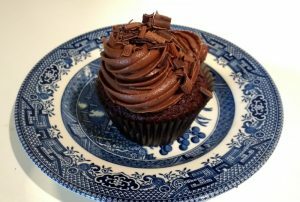 Chocolate sponge cupcakes with chocolate buttercream icing. Vegan. 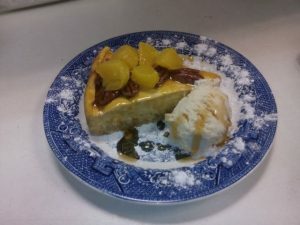 Can be made gluten free, soya free and nut free if required. 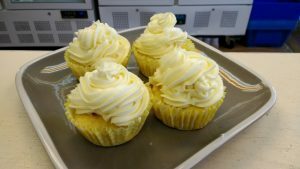 Lemon sponge cupcakes with either lemon buttercream or cream cheese frosting. Vegan. Gluten free and nut free option. 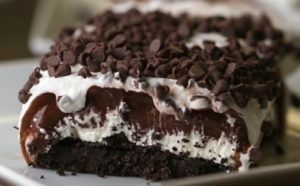 An Oreo biscuit base covered with layers of whipped cream cheese sauce and chocolate custard, topped with chocolate chips! Size: 9 inch (22cm) square approx.